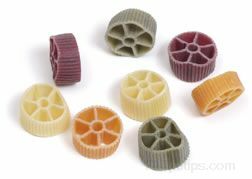 A wheel shaped pasta that is also known as ruote. Rotelle is also used as the name of a twisted spiral pasta, which is similar to rotini, only rotelle is larger in size. It is used to add a decorative touch to soups, salads and other dishes.